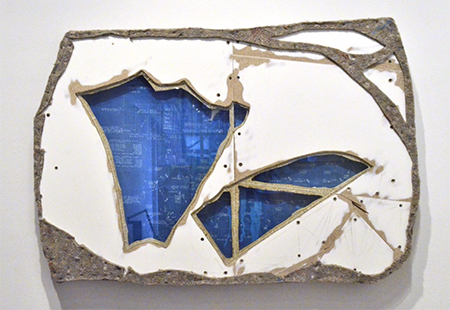 John Preus, "Oracle 4," 2016, mixed media on retired CPS blueprint, 31 x 45"
Artist John Preus has made his mark on Chicago with his signature ability to repurpose and transform found materials. The artist, also a fabricator, has been a major asset and contributor to other local artists’ works, including many of Theaster Gates’ largest projects. Worn, tactile objects and materials are at the crux of Preus’ practice; even as he gives these long-lived materials a new aesthetic existence, he also maintains and accentuates the meanings inherent in that which he has sourced, imbuing the artworks with potent social content. In “The Relative Appetite of Hungry Ghosts” Preus uses particularly loaded material: the contents of 49 recently shuttered Chicago Public elementary schools. Here, the school desks and upholstery are reconstituted into imaginative, interactive objects and a series of wall-bound pieces. A swing set — a structure that has appeared many times in Preus’ oeuvre — is installed in the gallery, with painted metal school chairs altered for the seats, and fragments of desktops comprising the support. “Oracle 4,” one of Preus’ smaller relief pieces, is particularly poignant. Hunks of desktops are cobbled together, along with wooly-looking upholstery batting, with sections of a CPS building blueprint showing through windows cut into the particleboard. Viewing these initial plans through the now-abandoned materials leads one to contemplate what happened between the building and closing of the schools, the how and why that lead to the current fate of the things with which Preus composes the works — and most importantly, the children who used them.